The 2005 is a beautiful Calon Ségur, with sweet mocha, black cherry, leathery fruit, medium to full body, attractive purity, a gorgeous texture, and serious nobility, gravitas and density. Drink it over the next 20-30 years, yet it is surprisingly accessible. Drink 2015 - 2045. This great St.-Estephe estate has turned out a succession of brilliant wines. The 2005, a blend of 60% Cabernet Sauvignon and 40% Merlot, has put on weight over the last year. An opaque ruby/purple hue is accompanied by a sweet nose of earth, smoke, cassis, and cherries as well as a textured, full-bodied mouthfeel. While the tannin is high, there is beautifully sweet fruit underlying the wine’s structure. It will require 8-10 years of cellaring after release, and should drink well for three decades. This is a blend of 60% Cabernet Sauvignon (as ripe and impressive as Madame Gasqueton has ever seen) and 40% Merlot. The Merlot was harvested between September 15-22 and the Cabernet Sauvignon was brought in during the first two weeks of October. 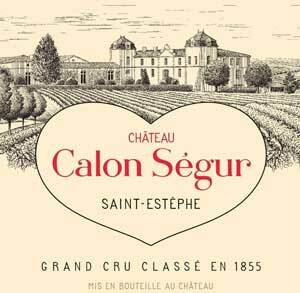 The result is a classic Calon-Segur exhibiting a dense purple color, ripe black cherry, cassis, smoke, earth, and new oak characteristics, powerful but sweet tannin, a huge texture, and broad, concentrated flavors. It will undoubtedly close down after bottling. Anticipated maturity: 2012-2030+. The 2005 is a beautiful Calon Ségur, with sweet mocha, black cherry, leathery fruit, medium to full body, attractive purity, a gorgeous texture, and serious nobility, gravitas and density. Drink it over the next 20-30 years, yet it is surprisingly accessible. Tight and dense still but so integrated and seamless in texture. Aromas of chocolate, hazelnuts, dried spices and currants. Full body, superfine tannins and a texture that is so caressing and beautiful. Drink or hold. Dark-colored, with beautiful aromas of chocolate, spices and violets. Full-bodied, with superfine tannins and a long, long finish. Fresh and refined. A beauty. This is such a pleasure to taste. Tasted blind. Blackish crimson. Sweet, well developed nose. Lots of fruit concentration in the middle. Pretty classy stuff. Lovely full ripe fruit fully covers the tannin. Just very slightly bitter on the end. Very dark. Sweet and furry with very harsh acidity and drying tannins. Rather a caricature. Bitter finish. Date tasted 18th Feb 09. Deep, bright ruby-red. Deeply pitched aromas of black raspberry, black cherry, leather, smoked meat, earth and menthol. Chewy, brooding and deep, with concentrated black cherry, menthol, mineral and leather flavors framed by a powerful spine of acids and tannins. Really saturates the palate on the tannic back end. I'd give this classic St. Estephe a decade of aging, at which time this wine may well merit an even higher score. Opulent, well knit with fine fruit and spice notes. Luscious entry, ripe fruit notes, yet on a tight rein. Potent yet restrained, with silky tannins. Drink from 2015. Awarded 5 stars.